(a) Apply engine oil to the 2 O-rings on the vacuum pump assembly. 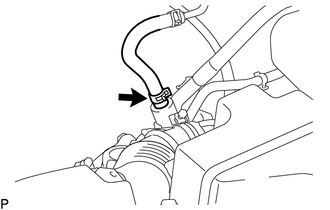 (b) Apply engine oil to the inner surface of the installation hole. (c) Install the vacuum pump assembly so that the oil pipe engages with the hole of the camshaft and the coupling teeth with the grooves on the camshaft tip. Ensure that the vacuum pump assembly is installed securely. Be careful not to pinch the O-ring. 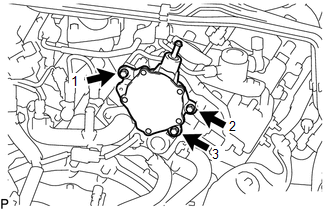 (d) Install the vacuum pump assembly to the engine assembly with the 3 bolts in the order shown in the illustration. After installation, check that there are no gaps between the matching surfaces and that the vacuum pump assembly is no installed at an angle. (a) Install the No. 2 water by-pass pipe with the 2 bolts. (a) Connect the union to check valve hose and slide the clip to secure it. (a) Remove the V-bank cover sub-assembly. (b) Slide the clip and disconnect the union to check valve hose from the vacuum pump assembly. (c) Connect the hose of the vacuum gauge to the vacuum pump assembly. (d) Start the engine and warm it up for more than 2 minutes. (e) With the engine idling, check the negative pressure of the vacuum pump. The vacuum pump assembly is listed as one of the 200000 km (124000 mile) maintenance parts. Make sure to disassemble and inspect it every 200000 km (124000 miles) and replace parts as necessary. (f) Remove the vacuum gauge from the vacuum pump assembly. (g) Connect the union to check valve hose to the vacuum pump assembly and slide the clip to secure it. (h) Install the V-bank cover sub-assembly. 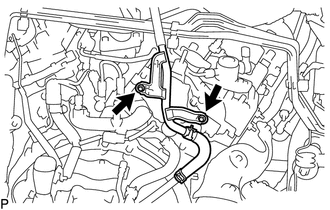 (a) Slide the clip and disconnect the union to check valve hose. (a) Remove the 2 bolts and separate the No. 2 water by-pass pipe. (a) Remove the 3 bolts and vacuum pump assembly from the engine assembly. 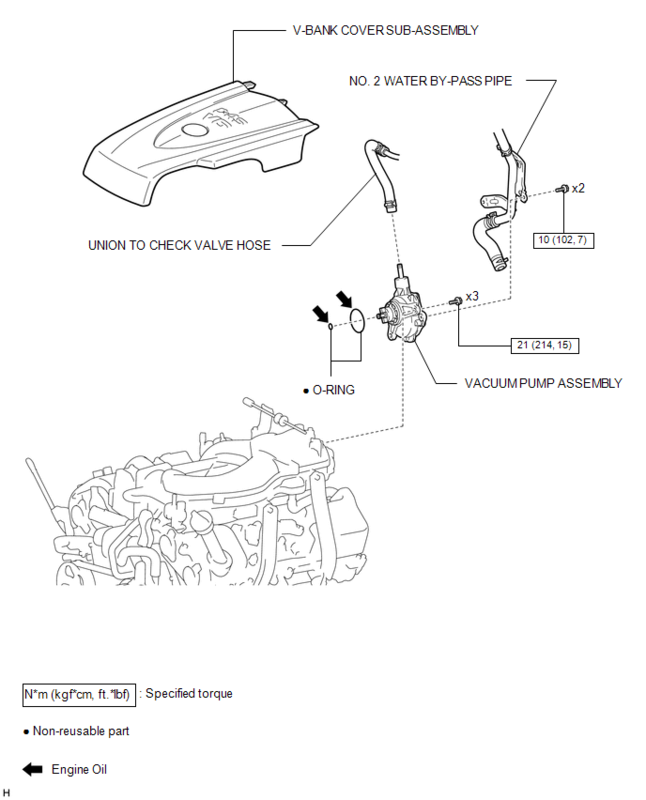 If there are any oil leaks or any O-ring is damaged, replace the vacuum pump assembly with a new one.